Panasonic TX-L42ET50 review | What Hi-Fi? Panasonic has been lauded for its plasma screens over the years, but it’s making ripples with its LED-backlit LCD screens too, and this is a good example. The Panasonic TX-L42ET50 comes better equipped than most, with plenty of connections including four HDMI and three USB ports, an SD card slot, and digital inputs. Built-in wi-fi and ethernet connections also enable you to browse the internet and stream images, music and videos from stored devices on your home network. All of this is accessible on the Media Player tab, while Panasonic’s cloud-based VIERA Connect service is a portal to a multitude of online entertainment content. Along with interactive games, on-demand music and videos via YouTube and Dailymotion, and social networking sites, there’s BBC iPlayer for catch-up TV. Streaming is uninterrupted and fast, but the smart hub’s interface is now looking rather clunky next to more streamlined efforts from Sony and Samsung. The remote control is also a standard affair, but it is responsive, and the smartphone control app is good to use. This LCD set doesn’t have a Freesat tuner, but there’s plenty to be getting along with via Freeview HD. Set up is an easy affair, and the electronic programme guide is simple to navigate. Off-air pictures are delivered with decent detail definition, but it’s when you feed in a Blu-ray disc of BBC’s Wonders of the Solar System that the L42ET50 is shown in its best light. The panoramic scenes of the sand dunes of the Namib Desert are delivered with excellent clarity and detail. The LCD screen etches out edges sharply, and the colour palette is nicely judged, being rich but not overblown. The LED-backlighting is smooth and there is no discernible patchiness, although there is some colour banding during wide pans of the sun in eclipse. Switch to a DVD of Mission Impossible: Ghost Protocol for the action sequences, and the motion handling is stable and relatively smooth. Panasonic TX-L42ET50: 3D picturesThe TX-L42ET50 is an active 3D set – the active shutter glasses need to be purchased separately – but 3D pictures aren’t as silky smooth or easy on the eyes as on the LG 42LM660T or Sony KDL-40HX853 sets. This set doesn’t quite reach the same level of insight as the Panasonic TX-P42GT50 either. You could add a bit more punch to the colours by switching the picture mode to Dynamic, but that makes everything a bit glaringly vibrant, while the Cinema mode adds a cool tint to the colours. Sound quality is comparatively more rounded and has less of a harsh edge than can be found in rivals like the Toshiba screens in this test. You can try switching to either speech or music mode, but speech mode pushes the midrange forward while music mode makes it sound even more hollow, and both end up sounding unnatural. We kept it at normal. 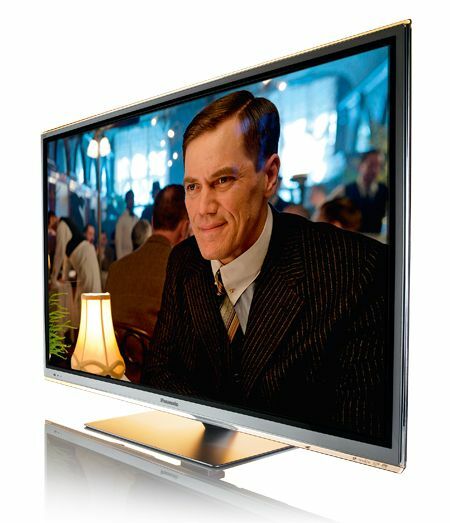 Inevitable comparison against its class-leading plasma counterpart shows up the Panasonic TX-L42ET50’s limitations. And Sony's KDL-40HX853 LCD is a much better performer, at only £100 more. All in all, a good if fairly unexciting set.